Another SharkFest has ended and, long story short, it was a great success. The 11th annual SharkFest 2018 Wireshark Developer and User Conference took place at the Computer History Museum in Mountain View, CA, between June 25 - 28. This year, the conference also celebrated 20 years of Wireshark, the most popular open source packet analyzer on the market. Launched in 2008, SharkFest is a series of annual educational conferences that take place in different parts of the world, focusing mostly on sharing knowledge, experience and best practices among the Wireshark developer and user communities. 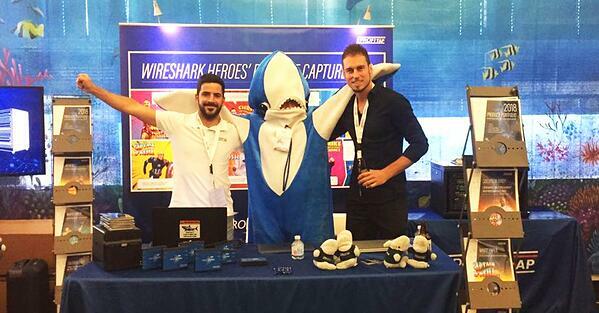 SharkFest is a great event for Profitap to attend as a vendor and sponsor. Here we have the unique chance to get useful feedback from Wireshark developers and users. Of course we're also there to showcase how Profitap solutions combined with Wireshark can forge Packet Analysis Heroes. As the world’s foremost and widely-used network protocol analyzer, Wireshark captures and visualizes everything that is happening on a network. Profitap hardware solutions give network engineers total visibility into the network. Combine Wireshark with Profitap hardware and you have an incredibly versatile traffic capture setup for analysis and troubleshooting that you can take everywhere you go. This year the new Packet Bay area gave attendees a great chance to get hands-on experience and see what it’s like to work with ProfiShark, tapping into 1G and 10G lines, capturing timestamped packets, and testing our new Long-Term Capture setup with a ProfiShark and a NAS. Read more about portable network tapping on this article. These last few months, we had the pleasure of working together with a great team of Packet Analysis Heroes, all of them experts in various fields, like network forensics, network troubleshooting, cybersecurity, etc. They’ve done an amazing job writing about their experience when using the ProfiShark in the field and in a data center environment. All these articles don’t just showcase the products they use – they offer unique insight in the workflow of an expert. Feel free to take a look at their writings and videos below. You will hear more of this band of network heroes in the coming weeks. You can also find all these articles on the Profitap Library. All these writings were presented for the first time at this year SharkFest US under the title “Wireshark Heroes' Favorite Capture Tool”. We can’t end this article without sending a big thank you to all the amazing people behind the conference, who made it all possible. And to all attendees, from the network heroes to all the developers and network professionals, that supported us and dropped by to chat with the team. We’ll see you all at this year's last SharkFest in Vienna (October 29 – November 02) and remember, it all starts with visibility!